I became fascinated with how things moved and was drawn (pun intended) to animation. I think you can see that influence today of that motion-driven style of my own artwork. Frank Espinosa is an animator, cartoonist, and Creative Director at Zum Zum Books. He has worked extensively for Disney and Warner Bros. Espinosa is the author of Rocketo (Image Comics, 2006), nominated for three Eisner Awards. Research interests: graphic novels, illustration, art instruction and direction. Espinosa attended the School of Visual Arts in NY in film and animation. Earlier in his career he worked for Walt Disney Animation and Consumer Products, and later was Art Director at Warner Bros. Consumer Products, producing an award-winning character-design manual, redesigning the Looney Tunes characters, and creating Baby Looney Tunes and the complete series of the Looney Tunes postage stamps. His academic work includes participation in the Ohio State University and Collins College Lecture Series and developing a comic-book series for Princeton University. Espinosa created and illustrated a full-color graphic novel based on the life of Salvatore Ferragamo, from which illustrations were showcased in store windows world-wide. Works in progress: illustrating Frankenstein, Dracula, Candide, and 20 Thousand Leagues under the Sea. MIT's Media Arts and Sciences and Writing Programs hosted Espinosa during his two-year tenure as an MLK Visiting Scholar. He taught a series of classes on character design and world-making. 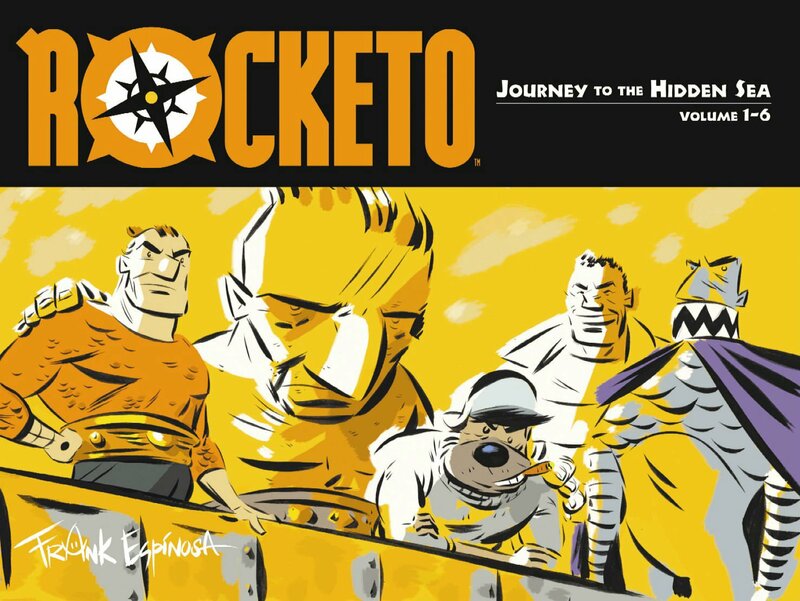 ​Frank Espinosa, the creator of the critically acclaimed comic book series Rocketo, and a visiting artist at MIT, recently sat down with second-year CMS graduate student Sam Ford to discuss his work in the comics industry, his time at MIT and his series of classes on character design and world-making. Rocketo , originally published by Speakeasy Comics, started as a 12-issue series that resulted in two trade paperbacks, one of which has already been released. Tell me a little bit about your work prior to coming to MIT. I was an art director at Warner Bros. Consumer Products for 13 years, but I was always interested in comics. I don’t think you can be in animation and not be interested in comics or be in comics and not be interested in animation. They are blood brothers. Both are visual storytelling. I had worked on comics years ago, and I decided that it was time I started working on my own stuff. Rocketo is a story that takes place on earth about 2,000 years from now. There’s been a great cataclysm that has depopulated 90 percent of the planet, and mankind has reverted to genetic engineering to repopulate the world. There are brand new continents and brand new islands now, so the characters are re-exploring the world. In this future world, the magnetic field of the earth has been blasted. These people are mappers, like living compasses. They are explorers, and Rocketo is one of them. In these books, we are going to see his journeys. You have completed one run that establishes the world of Rocketo . What are you working on now? What are you plans after you finish these four journeys? I will probably move on to something completely different, but the world of Rocketo is so close to me that I will probably go back to it. I may not return as regularly, but, every couple of years, I would like to release another Rocketo trade that would cover the years between each journey, which take place every four years. There are all these untold stories that I could tap into, but I don’t want to develop a series that goes on for 30 years. My main goal was to chart a man’s life from birth to death in narrative form. When you look at these four novels, you would see the beginning of a character and then a natural evolution. I came here because Writing Professor Junot Diaz liked Rocketo . We had a nice, long chat, and it turns out that we had a lot in common. One day, I asked if there was any way I could get involved at MIT, and I ended up as a visiting scholar here. My goal is to help students think like art directors, to be able to communicate with the creative people they are going to meet in the future and to be able to speak the same language and communicate with these people. You are involved in both the Writing and Comparative Media Studies programs? Yes. The class I’m teaching for CMS right now offers real-time advice to students because I’m working on my actual comic while I’m teaching. As I work on these things, I am bringing drawings to class and talking to my students about problems I’m having. I’m learning a lot from the teaching process, and I’m learning a lot from the students, too. You are teaching a similar class in the spring as well? Right now, we are dealing primarily with characters. In the spring, we are going to look more into the world-creating aspect of the class. The work from this term will carry over. Next term, we will talk about making actual comics or games or whatever project students are working on in a more hands-on way. You mentioned that you are working on Rocketo in addition to advising and teaching this class. What else are you working on? The New World project will take up quite a bit of my time, but I’m also working on a couple of little things for Marvel Comics and another Image comic series on a gangster-related project. I’m staying pretty busy right now.